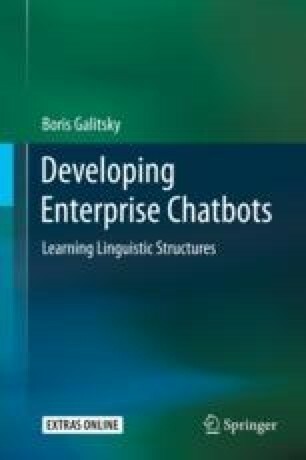 In this chapter we implement relevance mechanism based on similarity of parse trees for a number of chatbot components including search. We extend the mechanism of logical generalization towards syntactic parse trees and attempt to detect weak semantic signals from them. Generalization of syntactic parse tree as a syntactic similarity measure is defined as the set of maximum common sub-trees and performed at a level of paragraphs, sentences, phrases and individual words. We analyze semantic features of such similarity measure and compare it with semantics of traditional anti-unification of terms. Nearest neighbor machine learning is then applied to relate a sentence to a semantic class. Using syntactic parse tree-based similarity measure instead of bag-of-words and keyword frequency approaches, we expect to detect a weak semantic signal otherwise unobservable. The proposed approach is evaluated in four distinct domains where a lack of semantic information makes classification of sentences rather difficult. We describe a toolkit which is a part of Apache Software Foundation project OpenNLP.chatbot, designed to aid search engineers and chatbot designers in tasks requiring text relevance assessment.